The 30" cut Toro TimeMaster Features a very wide cutting deck accompanied by two blades providing you with an exceptional cut above all competitors. The Toro TimeMaster can mulch, catch or simply side discharge at your discretion making it the ideal mower for all situations. 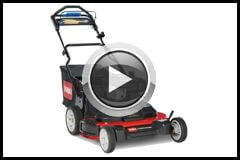 Its modern and light weight design makes the Toro TimeMaster easy to Manoeuvre around obstacles in your backyard. And with the adjustable handles you can easily store your TimeMaster mower away without taking up too much room in your garage. 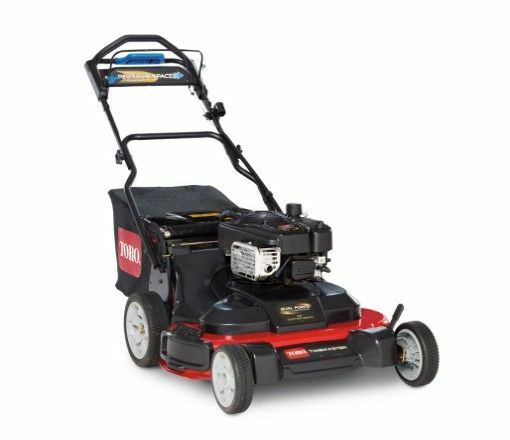 Powered by a powerful 8.75 ft.-lb gross torque Briggs & Stratton OHV engine delivers the performance durability that Toro is known for. The very generous 30" cutting deck lets you handle large ares of grass quickly and easily, reducing your mowing time by up to 40%. The dua force twin blade cutting system and Toro Atomic blades cut the grass into extremely fine mulch for a superior quality of cut and a healthy, rich lawn. This technology automatically adjusts the speed of the mower to the pace at which you would like to walk at. Helping you to mow your lawn in comfort, a leading technology in the self-propelled industry. Ensurs that the blades stop when you let go of the handle although it keeps the mower running. Meaning you can step away from the machine without the burden of having to restart the mower. The TimeMaster can have the handles easily adjusted to suit your height ensuring a more comfortable mowing experience for the operator. Or the height can be changed for storage purposes. The washout port is a convenient and easy way to clean the deck of your Toro TimeCutter. The Toro TimeMaster is ensured to start from one or two pull for up to 3 years!